Don’t have a dyno tuning centre nearby? Are you more of a D.I.Y. (do it yourself) type? Are you constantly changing parts on your bike? If you answer "yes" to any or all of the questions above, then our Auto Tune kit is for you. 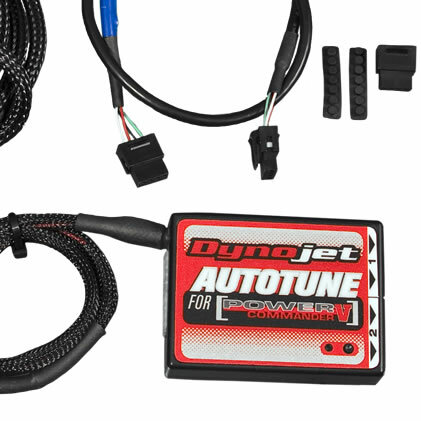 The Dynojet Auto Tune kit is an "add on" accessory that can be used with any of our Power Commander V’s. We have taken virtually the same technology that our patented Tuning Link dynamometer software (for automated Dyno tuning) uses, along with Bosch Wide Band O2 sensors and miniaturized it to be used on your bike, ATV, or UTV, while you ride. Once installed, the Auto Tune kit monitors the fuel mixture (by installing the included Wide Band O2 sensor in the exhaust). It then sends this information to the Power Commander V and automatically corrects it while you ride. Each map that we offer has pre-set Air/Fuel ratio values included that we find to be the best overall settings. This lets you simply plug in the unit and let it do the work. For Harley Davidson models we ever monitor and adjust each cylinder individually for increased precision as on these models required fuelling can vary significantly between the front and rear cylinder. models of bikes, it is also possible to adjust the Air/Fuel ratios "per gear". This gives you total control of the fuelling in every gear and throttle/rpm area if required. These are a "dual O2 sensor" versions made specifically for Harley Davidson models. They come with two O2 sensors, a control module with 2 sensor inputs, a CAN connection cable, CAN termination plug, and two custom length sensor cables. They also includes a built in power connector that plugs directly into the bike's stock wiring harness for easy connection. AT-100B and AT-101B also come with 2 weld boss kits supplied. This version is a "universal fit", single O2 sensor kit. It can be used on any vehicle that has a PCV installed on it. It comes with a single O2 sensor, "cut to length" sensor cable, control module, O2 sensor, one weld boss kit, a CAN connection cable, and CAN termination plug. It requires a ground and +12 volt connection to be made using the supplied wiring hardware. . This Auto-tune Universal kit is designed for twin cylinder motorcycles/ATVs that use the Power Commander V allowing control of two cylinders separately and simultaneously. The kit includes two O2 sensors, a control module with 2 sensor inputs, a CAN connection cable, CAN termination plug, two custom length sensor cables, and two weld boss kits. It also requires a ground and +12 volt connection to be made using the supplied wiring hardware. AutoTune devices will NOT drive a gauge. The WideBand2 will drive a gauge and pass the necessary information to a Power Commander V for the AutoTune function to work. To use these kits your exhaust must have an 18mm bung installed. If your current exhaust does not have this size bung you must weld one on. Certain kits come with the necessary weld-on bung. The latest Dynojet Power Core C3 Tuning Software offers advanced Auto-tune setup capabilities in which you can designate specific O2 sensor channel streams to specific cylinders.